The universe of L. Frank Baum’s Wizard of Oz has inspired a number of online slots in the past and here we have one more to enjoy in the shape of Book of Oz, a release from Microgaming which offers free spins and the chance to respin any reel for a small price. 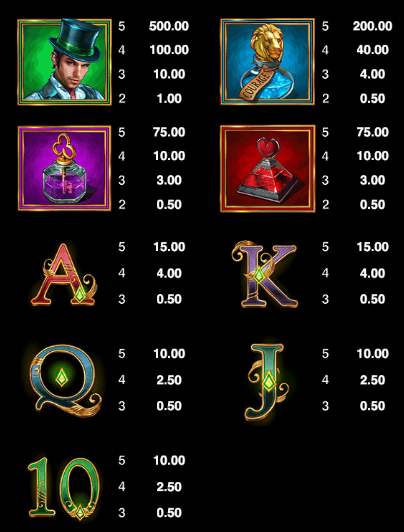 Book of Oz is a five reel slot with three rows and ten fixed paylines; there’s an art deco feel to the design which fits with parts of the original novel and an appropriate soundtrack to accompany your gameplay. The four higher value symbols include the top-hatted wizard and three potions in blue, purple and red; 10, J, Q, K and A make up the lower values. The book is both the wild and the scatter symbol and it will substitute for all others to help form winning combinations. Below each reel is a ‘Respin’ button and this is available on any base game spin; it allows players to respin that one reel for a price relative to your stake and the potential for any wins. This is triggered by landing three, four or five of the book wild/scatter symbols anywhere in view for which you will receive 10, 12 or 25 free spins respectively; the wizard becomes a special symbol during this round and if he appears at the same time as a winning combo he will expand to cover his whole reel and pay out accordingly. The book makes an appearance during the feature meaning that it’s possible to trigger more spins for your pleasure, as you can see from our gameplay video. 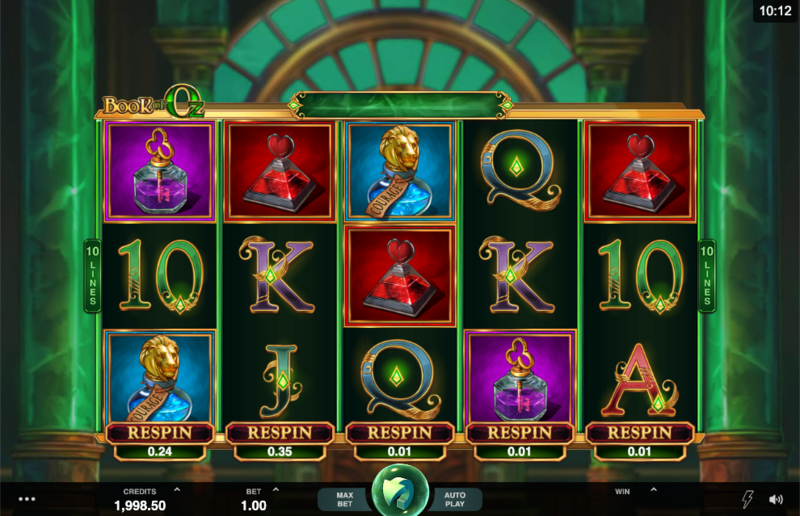 Book of Oz is a nicely designed slot with an atmosphere enhanced by the music and the art deco design; be careful with the respin option, it can prove costly if you use it too often.